A. It should not surprise us that the church is under attack. 1. The church has always been under attack. 2. The book of Revelation was written to provide comfort and assurance when the church was under attack from the seemingly all-powerful Roman Empire. B. The church is under attack today from without. 1. We have already seen how Satan is attacking the church today by sowing confusion. 2. I doubt that any of us are surprised that the church is under attack from without. C. The church is also under attack today from within. 1. The church of Christ is the church that Jesus promised to build in Matthew 16. It is the church of prophecy in Daniel, Isaiah, Joel, and Micah. It is the church that was established in Acts 2. It is the church to which we were added by God when we were saved. It is not a man-made organization. 2. But there are some among us who reject all of that. To them, the church of Christ is just another denomination, and it is arrogant, they say, for us to suggest otherwise. 3. We sprang to life, they argue, as a vibrant new movement in the 1800’s. The “pioneers” of “our movement,” they say, are the leaders of the restoration movement, and the writings and sermons of those restoration leaders are our source documents. a) Under this view, we are no different from the Baptists, the Methodists, or any other denomination. We may differ on certain theological questions, but we are all man-made religious organizations of recent origin. b) According to them we really are just Campbellites. (1) That moniker is not only insulting to the Lord's church and to Alexander Campbell, but it is also historically inaccurate. (2) In 1804, Barton W. Stone and others officially withdrew from the Presbyterians and begin to call themselves Christians only. They adopted the Bible as their only guide, they announced their belief in the complete autonomy of the local congregation, and they repudiated all man-made religious organizations. Shortly thereafter they began to teach salvation by baptism for the remission of sins. (3) Barton W. Stone did not meet Alexander Campbell until 1824, when the latter made an extended tour of Kentucky. When Campbell came to Kentucky, the church had already been restored in that area. Were they “Campbellites” before ever having met Alexander Campbell? (4) One of the congregations that Stone helped to establish was the Bethlehem church of Christ in Tuckers Cross Roads, Tennessee. My father (and co-teacher) preached there from 1955 to 1957. The church was restored in Tuckers Cross Roads before Barton Stone ever met Alexander Campbell. Members of the Lord’s church are not Campbellites – we are Christians and Christians only. (5) G. C. Brewer told the following story: A community in Kentucky decided to build a building for community religious and social use. Several denominations in the community led in the effort. Our brethren who lived in the community decided not to cooperate. When the building was completed, the people who built it naturally did not want it to be used by those who had declined to have any part in building it. They were in the process of putting a clause in the deed that allowed anyone in the community to use the building "except Campbellites." A knowledgeable man among them said, "If you want to keep those folks out of this facility, that won't do it. I have heard some of them say they aren't Campbellites, and they do a pretty good job of proving it." After considerable discussion, they finally wrote, "This building may be used by anyone in the community except Christians." (6) We are Christians. We wear no other name, nor should we want to wear any other name. c) The primary theme of this attack on the church is that the church of Christ is just another denomination, and we in the church should all just admit it and move on. They argue that we are just deceiving ourselves if we believe that we are members of the restored New Testament church. d) This attack is extremely serious. Why? (1) First, it is serious because of its source. It is coming primarily from within our Christian colleges and universities, and thus it is initially and specifically targeted at our children. (2) Second, it is serious because of its effect. It undermines the foundation of the church. If this church is “our church” and if it is of a recent, human origin, then it is not the Lord’s church. It is not and cannot be the kingdom made without hands in Daniel 2. It is not and cannot be the church established by God in Acts 2. It is not and cannot be the church that Jesus promised to build in Matthew 16. 4. Before we examine this attack in detail, let’s begin by studying some of the restoration movements in the Bible. We can then compare these restoration movements to the American restoration movement of the 1800’s. 1. The Bible tells us that a restoration was needed. a) God commanded his people in Exodus 20:3-5 to worship Him and Him alone. That commandment had been abandoned by the time Josiah became king. 2. The Bible tells us that a restoration occurred. a) Josiah sought to restore the worship of the one true God, and he began to eliminate the high places where idols were worshipped. (1) 2 Chronicles 34:3 For in the eighth year of his reign, while he was still young, he began to seek the God of his father David; and in the twelfth year he began to purge Judah and Jerusalem of the high places, the wooden images, the carved images, and the molded images. b) Josiah next worked to restore the house of God to its rightful state. (1) 2 Chronicles 34:10 Then they put it in the hand of the foremen who had the oversight of the house of the LORD; and they gave it to the workmen who worked in the house of the LORD, to repair and restore the house. c) While those repairs were underway, the Law of Moses was discovered. (1) 2 Chronicles 34:14-19 Now when they brought out the money that was brought into the house of the LORD, Hilkiah the priest found the Book of the Law of the LORD given by Moses. 15 Then Hilkiah answered and said to Shaphan the scribe, “I have found the Book of the Law in the house of the LORD.” And Hilkiah gave the book to Shaphan. …18 Then Shaphan the scribe told the king, saying, “Hilkiah the priest has given me a book.” And Shaphan read it before the king. 19 Thus it happened, when the king heard the words of the Law, that he tore his clothes. d) Josiah called all of the people together and read them the Law they were to follow. The King made a covenant to follow what was written in the book. (1) 2 Chronicles 34:29-31 Then the king sent and gathered all the elders of Judah and Jerusalem. 30 The king went up to the house of the LORD, with all the men of Judah and the inhabitants of Jerusalem – the priests and the Levites, and all the people, great and small. And he read in their hearing all the words of the Book of the Covenant which had been found in the house of the LORD. 31 Then the king stood in his place and made a covenant before the LORD, to follow the LORD, and to keep His commandments and His testimonies and His statutes with all his heart and all his soul, to perform the words of the covenant that were written in this book. e) Josiah also restored the observance of the Passover. (1) 2 Chronicles 35:18-19 There had been no Passover kept in Israel like that since the days of Samuel the prophet; and none of the kings of Israel had kept such a Passover as Josiah kept, with the priests and the Levites, all Judah and Israel who were present, and the inhabitants of Jerusalem. 19 In the eighteenth year of the reign of Josiah this Passover was kept. 3. Key Question: Did Josiah create something new or did he restore something old? a) What was the result when Josiah and the people read and followed the word of God? Did they create a new man-made organization or did they restore a divine organization? b) What did Josiah come up with that was new? Was Josiah the first to suggest that there is only one God? Was he the first to suggest that idolatry was wrong? Did Josiah come up with the Sabbath day? Did Josiah create the Passover? Or did Josiah restore these beliefs and practices? 1. A similar restoration occurred in Nehemiah 8:1-18.
a) Nehemiah 8:1-18 Now all the people gathered together as one man in the open square that was in front of the Water Gate; and they told Ezra the scribe to bring the Book of the Law of Moses, which the LORD had commanded Israel. ... 14 And they found written in the Law, which the LORD had commanded by Moses, that the children of Israel should dwell in booths during the feast of the seventh month, … 17 So the whole assembly of those who had returned from the captivity made booths and sat under the booths; for since the days of Joshua the son of Nun until that day the children of Israel had not done so. And there was very great gladness. 18 Also day by day, from the first day until the last day, he read from the Book of the Law of God. And they kept the feast seven days; and on the eighth day there was a sacred assembly, according to the prescribed manner. 2. This restoration follows the same pattern that we saw with Josiah. a) First, there was a departure from the word of God. Men had rejected the commandments of God and were no longer worshipping God properly. They had rejected God’s plan and God’s pattern. b) Second, someone found the word of God, read it, and discovered that a departure had occurred. That person decided to follow the word of God rather than the word of man. c) Third, the pattern and practices found in the word of God were restored. The people began to worship and serve God according to His commandments. Restoration had occurred. d) KEY POINT: As far as those people were concerned in Nehemiah 8 and 2 Chronicles 34, the situation following the restoration was as if no departure had ever occurred. That is, if no departure had ever occurred, they would have been worshipping and serving God exactly as they were now worshipping and serving God. Why is that important? Because it tells us that the restoration was completed. That which was lost had been restored. C. History tells us that a restoration was needed. 1. As in the days of Josiah and Nehemiah, by the 1800’s (and much earlier) men had rejected the pattern and plan found in the New Testament for the church. 2. Their churches and their creeds were man-made. 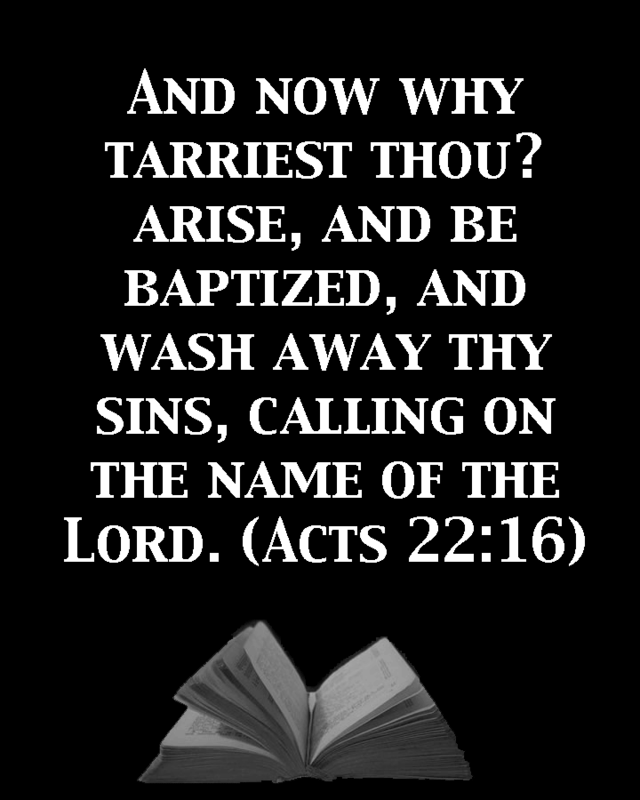 They had rejected the gospel plan of baptism and repentance found in Acts 2. They had rejected the divine pattern for proper worship and church organization. D. History & our presence here today tell us that a restoration occurred. 1. Men and women turned to the word of God and read about God’s plan for the church. They recognized that departures from that plan had occurred, and they rejected those departures. They began to worship and serve God according to the commandments in his word. a) We owe them for their example of courage and faithfulness in the face of sometimes extreme opposition. We owe them for their widespread proclamation of the gospel – something to which many of us indirectly owe our own knowledge of the truth. We owe them for their willingness to change when they discovered that they were in error and restoration was needed. We owe them for their love of God, his word, and his people. 3. But there are also many things that we do NOT owe the restoration leaders. a) They did NOT give us the Bible. They did NOT give us the church. They did NOT give us the pattern for proper worship. Our history does NOT begin with them! b) And they would be the very first to agree with those statements! 4. Many of us here today are here because of the restoration movement and its leaders’ decision to return to the pattern revealed in the word of God. And for that we owe the leaders of the restoration movement a great debt. But they did not create the church, and if they were here they of all people would be the most upset by the attacks we are studying today. 5. These attacks are carried out under the guise of honoring the restoration leaders, but it does just the opposite. Rather than honor the restoration leaders, these attacks accuse them of creating the very thing they were fighting against – man made religious organizations. The restoration leaders would not feel honored by this modern day attack against the Lord’s church. 6. How can we tell that the restoration was completed? Because the church became as if no departure had ever occurred. That is, if no departure had ever occurred, people in the church would have been worshipping and serving God exactly as they were now worshipping and serving God. If we can say that today, then the church has been restored (past tense!). a) If the restoration has not been completed, then what is it that we lack? And why haven’t we fixed that issue? b) Are we perfect? Of course not. But are we following the pattern for the Lord’s church revealed in the Bible? Absolutely. The church has been restored. 7. What did Alexander Campbell or Barton W. Stone come up with that was new? Were they the first to sing without the use of instruments? Were they the first to suggest that baptism for remission of sins is essential? Were they the first to partake of the communion on the first day of each week? Were they the first to base their practices and beliefs on the Bible rather than on man-made creeds? Were they the first to have autonomous congregations rather than man-made hierarchies? 8. They were RESTORATIONISTS! They were restoring something old, not creating something new. 9. If you take an old piece of furniture or a classic car and you restore it, what have you done? Have you created a new piece of furniture? Have you created a new car? Common sense should tell us that it was not the intention of a RESTORATION movement to create something new! 10. The Lord’s church did not originate with the restoration movement anymore than Judaism or the Law of Moses originated with King Josiah or Nehemiah. E. What is the motive for these attacks? 1. You may be wondering at this point about the motive behind these attacks. a) We can only surmise at to motive, but my opinion is that it has a great deal to do with a desire on the part of some to fit in and be accepted by what they call “the larger religious community.” This feeling is especially prevalent in a university setting, which would explain why universities are the source of most of this. b) Just as Israel rejected God as king so that they could be like the countries around them, some among us appear to have rejected Christ as king so that they can be like the denominations that surround us. c) John 12:42-43 Nevertheless even among the rulers many believed in Him, but because of the Pharisees they did not confess Him, lest they should be put out of the synagogue; 43 for they loved the praise of men more than the praise of God. 2. If you think I am overreacting, let me [Eric Hall] add a personal note – I have seen these attacks in action. I have been a member of more than one congregation where these attacks not only occurred, but were endorsed by the leaders and by many of the members. So if you are tempted to tell me this isn’t really happening, let me stress – I know it is happening because I have personally witnessed it, and I have witnessed the damage that it has done and is doing. A. Attack #1: They tell us the “Church of Christ” is a man-made organization that was born of the Restoration movement. 1. We have just seen that the restoration movements in the Bible did not create a new man-made organization. Instead, they restored a divine organization. 2. All denominations are of human origin. The purpose of this prong of the attack is to convince us that the church of Christ is just another denomination. Because denominations are all man-made, they must first convince you that the church is a man-made organization, and that is what they try to do. 3. And what does the Bible say? Daniel 2 tells us that the church is not made with hands. It is the church that Jesus himself promised to build in Matthew 16. The Lord’s church was not built by man; it was built by the Lord. B. Attack #2: They tell us we should focus on the gospel. The church is just a secondary issue, along with many other similar secondary issues. 1. This is the second prong of the attack. To keep you from complaining about what they are doing to the church, they try to convince you that the church is really just a secondary issue. It is not part of the “Core Gospel” they argue. So as long as we all just agree to “celebrate Jesus” (whatever that means), it really doesn’t matter whether “our church” is man-made. 2. And what does the Bible say? a) Luke 24:47 [Jesus said] that repentance and remission of sins should be preached in His name to all nations, beginning at Jerusalem. b) Jesus very clearly connected the gospel message with the establishment of his church that, as Isaiah and Micah prophesied, began at Jerusalem. The gospel message was first proclaimed in Acts 2 on the day that the Lord’s church was established. Those who were saved on that day and every day since have been added by God to the church. The gospel and the church are inseparable. c) Warning bells should sound whenever you hear someone categorize and prioritize the word of God. We are to obey all of God’s commands for us – not just the ones we deem important. C. Attack #3: They tell us restoration is a continuing process. Thus, we cannot say that the church has been restored; we can say only, perhaps, that the church is being restored. 2. And what does the Bible say? The examples of restoration from the Bible that we studied earlier in this lesson clearly establish that restoration can be a completed process. It is completed when the proper worship and service of God has been restored, and we can know it has been completed by comparing what we are doing with the pattern revealed in Scripture. D. Attack #4: They tell us that as Christians we are all constantly growing, and thus, we can never say that we in the church have “arrived.” We can never say that the church has been restored. 1. The fourth prong of the attack is to convince you that we can never claim to be a part of the restored New Testament church because we, like all Christians, are constantly growing and maturing – and thus, they say, restoration is a continuing process. c) We just looked at two examples of restoration from the Bible. In either of those examples did we see each person continually struggling to discover truths they had not known? Or did we see a structural, organizational, and doctrinal return at a specific point in time to a pattern revealed in the word of God? And once that return occurred, didn’t we then see a state in which restoration had been fully achieved? 2. This attack can be dealt with quickly. a) Were first century Christians a part of the first century church? Yes. 3. That Christians need to grow spiritually is unrelated to the question of whether the church has been or is being restored. This attack is an example of a very common misdirection ploy. Let’s not fall for it! 1. The fifth part of the attack is to undermine the doctrine of the church by pointing out contradictions and inconsistencies in the writings of the restoration leaders. a) This particular example is an actual example – but the supposed quote from David Lipscomb cited in the article turned out to be fictitious. So not only was the logic faulty, but the premise was flawed as well. 1. An example of this phrase appears on a brochure I received in 1992 as a member at a congregation in Dallas. That 1992 series of lessons was my first experience with this attack on the church. I soon placed membership elsewhere. 2. This phrase is used to describe their quest. They want us to know where the church of Christ came from – or at least where they think it came from. But as we will soon see, they do not look in the book of Acts. According to them, our roots go back only to the early 1800’s. 3. And what about those of us who trace our roots back to Acts 2? That is why they call it a “discovery.” We are naive; they want to help us “discover” our real roots. 1. A “heritage” is something that comes or belongs to one by reason of birth. For those who believe that the church of Christ was “born” out of the restoration movement, a study of “our religious heritage” involves a study of the writings that accompanied our “birth” in the 1800’s. 2. Typically, those who stress the importance of studying “our religious heritage” will have very little to say about the book of Acts. Instead, they will focus on the writings of the restoration leaders, as if those writings were somehow binding on us today. 1. This is a code phrase for the church. Note that it is “our” movement, and hence “our” church, rather than the Lord’s church. 2. The implication is that we can have our church and you can have your own church. In their writings, they also speak of the Baptist movement, the Puritan movement, and a scholarly movement called Christian Humanism. Thus, according to them, there are many man-made religious movements, and we are just one such movement among many. 3. They argue that the birth of our movement occurred in the early 19th century. 1. This code phrase describes what we typically refer to as the pattern for the church revealed in Scripture. Singing, partaking of communion each Lord’s day, autonomous local congregations, the role of women in leadership, etc. are all just “our” traditions – just a part of our religious heritage. We have our traditions, and you can have your own traditions. 1. We talked about this phrase in an earlier lesson. You will hear the phrase “our church” a lot from this crowd, yet you will very seldom, if ever, hear about the Lord’s church. 2. It is interesting that they call us arrogant, yet they are the ones who have created their own church! 1. This code phrase is used as an umbrella to describe the church of Christ as well as denominations (such as the Disciples of Christ and the Christian Church) that have come out of the church of Christ. The implication is that we should all just be one big happy family under this umbrella of human tradition. 1. This phrase is used typically in a negative sense to describe the way in which we interpret the Bible. The idea seems to have developed that our practice of basing what we do on specific texts in the Bible (the so-called “proof text” method) was something new that came out of the restoration movement. 2. Having read and studied the writings of the apostle Paul, however, it seems to me that the so-called “proof text” method of Biblical interpretation predates the restoration movement by about 1800 years. 1. This code word is also used in a negative sense to describe those who believe that they are members of the Lord’s church established in Acts 2 and not a member of any man-made religious group. 2. They argue that such a belief is naive, and that we should instead study the history of our group so that we can take our proper place among all of the other denominations in the world. 3. Of course, our response is that we are not without history at all, but our history begins in Acts 2 (and even earlier if you include the prophecies that pointed toward the events in Acts 2). 1. This is a code phrase for the lost, but the lost have been redefined to include only those who are not members of any church, be it the Lord’s church or a denominational organization. A. The material on the website includes a list of the key players in this attack on the Lord’s church. 1. All of the key players are associated in some way with ACU and its Center for Restoration Studies. Most of the books quoted in that material were published by the ACU Press. 2. Let me say at this point that I have no connection with ACU, although I realize that quite a few here do. If this lesson upsets you, I hope that you are upset with ACU rather than with me. I am simply reporting to you what is being written and said by this group, and I am comparing what they have written and said with what I read in the Bible about the Lord’s church. 3. And if you have college age children, please make sure they are warned about what to expect. a) One wonders how the first century church was able to experience spiritual growth since they also naively assumed they were fresh and pure and that they espoused the Truth and nothing but the Truth. a) And they are doing their best to accelerate that decline! b) A warning bell should sound whenever you hear anyone in the church denigrate or otherwise belittle the idea that there is a pattern for proper worship and church organization revealed in the Bible. c) And if the restoration is not complete, then what is lacking? What part of the pattern are we not following? 1. We are faced with a choice this morning. Either the church to which we belong is the Lord’s church that we read about in Matthew 16 and Acts 2, or it is not. If it is not, then we are members of a man-made denomination, which cannot be the eternal kingdom made without hands in Daniel 2. 2. Either the church of Christ is the Lord’s church or it is a movement that “took shape in the late 1800’s and early 1900’s.” If you believe – as I do – that we are members of the restored New Testament church, then it is time for us all to wake up and recognize that the Lord’s church is under attack.